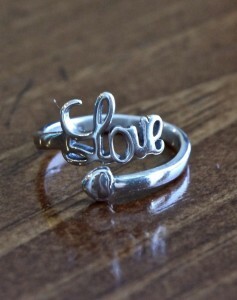 Just in time for Valentine’s Day, this sweet love ring is the perfect gift for that special someone. The sterling silver ring features an adjustable band with “love” in cursive writing and a heart – making it a perfect gift for both children and adults to celebrate an engagement, Valentine’s Day, anniversary, birthday or special occasion. Shop the Valentine’s Day Gift Collection today. Order by Sunday February 7, 2016 to ensure delivery for Valentine’s Day. We love our new Chunky Beaded Bracelet – they look great on their own or layered. A sterling silver charm is hand stamped with the initial that means most to you. 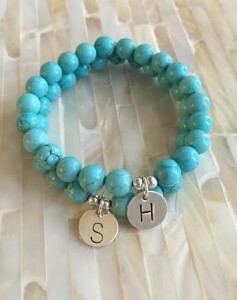 Natural 8mm magnesite gemstone beads resembling natural turquoise are threaded onto an elastic non-fraying cord that stretch comfortably over your wrist. Please look for Swarovski crystal pearls in gold, blue, black, pink, blue and cream to arrive soon. Mix and match for a fun, trendy look that is unique to you. Shop the Bracelet Collection today. Shop these gift ideas for a Mother of Four this Valentine’s Day and give her something hand stamped with love from K&S Impressions. Contact us at (913)583-0118 or kandsimpressions@gmail.com for assistance. This mother’s ring set will make a special gift to treasure forever. The hand stamped band is personalized with the names of her children up to 30 characters. Select four birthstone rings to represent each child or select one birthstone to represent herself or the month of her wedding. Sterling silver ring set includes one birthstone ring and one hand stamped wide band ring. Birthstones are available in every month and the set is available in sizes: 5, 6, 7, 8, 9. Personalize each side of this four-sided pendant with a name for her to wear close to heart. This design is perfect for a mom with four children, because the swivel feature allows each side a turn to face forward. The sterling silver necklace includes your choice of a pearl or Swarovski crystal birthstone and hangs on your choice of chain. Each side is hand stamped with up to six letters vertically or up to nine letters horizontally. 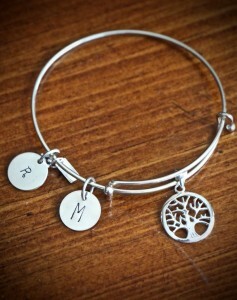 This personalized Tree of Life bangle bracelet looks great worn by itself with four initial charms to represent each of her children or stacked with other bangles each with their own initial charm. Tree of Life jewelry makes a meaningful gift for a mother to symbolize the strong connection between family generations, strong roots and wisdom. Sterling silver bangle features a double hook and expands up to 3.15″ in diameter with a tree of life pendant and your choice of initial charms. SHOP K&S Impression’s Mother’s Jewelry Collection Today. Save on a Teal Awareness Ribbon jewelry gift through the month of January to support Cervical Cancer Awareness Month. Our sterling silver ribbon charm is accented with teal Swarovski Crystals and looks great worn alone or layered with a personalized necklace or charm bracelet. Each year, an estimated 12,000 women are diagnosed with cervical cancer. But thanks to improved screening and vaccination, cervical cancer is a highly preventable and treatable cancer. So please encourage women across the country to get screened for cervical cancer today!. Shop K&S Impression’s AWARENESS JEWELRY COLLECTION and save 15%. enter code: cervicalawareness2016 at checkout – ends Sunday, Dec. 31 at 12pm est. 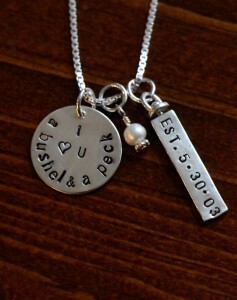 Find the perfect Valentine’s Day gift for your special daughter- something hand stamped with love by K&S Impressions. 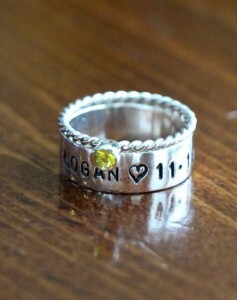 For an extra personal touch, customize with her name, initial and birthstone to make a lasting impression. Sterling silver necklace is personalized with your choice of initial and Swarovski crystal birthstone- a meaningful jewelry gift she is sure to love. 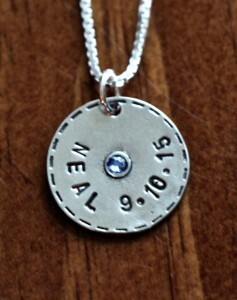 The circle charm is hand stamped and joined by a petite open heart charm and Swarovski crystal birthstone. Charms hang on your choice of chain. 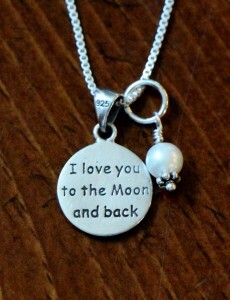 Sterling silver “I Love You to the Moon and Back” Birthstone Necklace is a meaningful jewelry gift for a daughter on Valentine’s Day. The double-sided circle charm has the popular quote “I love you to the moon & back” on the back side and a moon and star engraved on the front. Customize the necklace by selecting our choice of Swarovski Crystal Birthstone and chain. She will love this sterling silver initial heart ring personalized with her initials – a perfect jewelry gift for Valentine’s Day to show her how much you care! 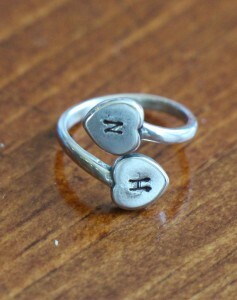 The ring features an adjustable band, accented with two hearts each hand stamped with one initial. Make it extra personal with this antiqued necklace hand stamped with her name, date or meaningful phrase of your choice. The circle pendant is detailed with a framed edge and includes your choice of inset Swarovski birthstone on a sterling silver chain. This sterling silver necklace makes a meaningful jewelry gift for your daughter to celebrate your special bond and honor the unconditional love between a daughter and parent. “Daughter my love for you has no end” is inscribed around the frame of the oval charm, accented with Swarovski crystals and an open heart. Charm hangs on your choice of chain. Show support for Cervical Cancer during January with this beautiful Awareness Ribbon charm detailed with Teal Swarovski crystals. The ribbon looks great worn alone or layered with a personalized charm hand stamped with a name, initial or inspirational word. Cancer Survivor Awareness Ribbon Personalized Necklace – A lovely jewelry gift to commemorate a woman’s courageous victory over one of life’s most severe challenges. 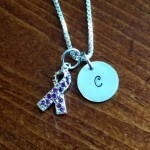 The “Survivor” tag is accented with a personalized initial charm and Cervical Cancer Awareness Ribbon. Initial Awareness Ribbon Charm Necklace – Customize this sterling silver necklace with a teal Swarovski crystal to show support for your special cause. Personalized with your choice of initial hand stamped on a 1/2″ initial charm and accented with an awareness ribbon. 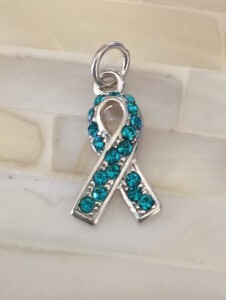 Sterling Silver Teal Awareness Ribbon – Beautiful ribbon is detailed with Swarovski crystals and looks great worn alone or layered with a personalized charm. Survivor Pewter Tag Necklace – Select a teal Swarovski crystal to represent cervical cancer and order a meaningful gift to commemorate her courageous victory! Awareness Ribbon Personalized Initial Necklace – Wear this personalized awareness ribbon necklace to help support your cause. 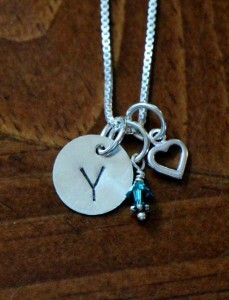 Customize the sterling silver necklace with your choice of Swarovski Crystal Ribbon and initial charm. SHOP K&S IMPRESSIONS’S AWARENESS JEWELRY COLLECTION TODAY. Be sure to give the most important woman in your life something hand stamped with love this Valentine’s Day. Shop these gift ideas for a Mother of Three and contact us at (913)583-0118 or kandsimpressions@gmail.com for assistance. This triple layered, raised rim necklace allows you to wear three joys in your life close to your heart. 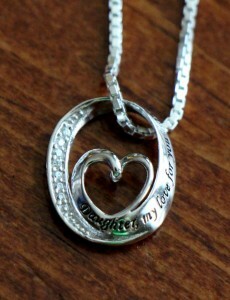 Customize a Mother’s necklace for a mom of three or family necklace with you, your spouse, a child or date. Sterling silver necklace features three hand-stamped raised rim charms accented with your choice of Swarovski crystal birthstone dangle. 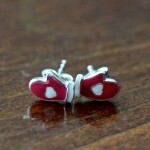 An optional double-sided heart/cross charm can be added. The vintage finish ensures this necklace will eventually become a vintage piece. 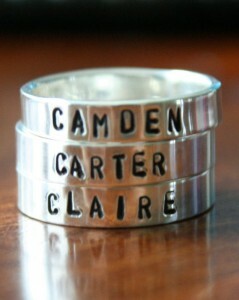 This triple ring set is personalized for a special mom of three with a child’s name, birth date or meaningful word. Each sterling silver ring measures 4mm wide and can be hand-stamped with a name, date or short phrase up to 12 characters. Ring is available in sizes: 5, 6, 7, 8, 9, 10 or 11,12. Personalize each side of this four-sided pendant with a name or date for her to wear close to her heart. This design is perfect for a mom with three or four children, because the swivel feature allows each side a turn to face forward. The sterling silver necklace includes your choice of a pearl or Swarovski crystal birthstone and hang on your choice of chain. Each side is hand stamped with up to six letters vertically or up to nine letters horizontally. 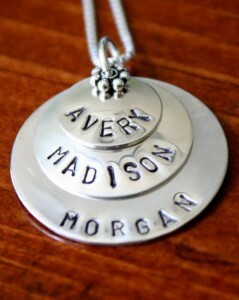 Triple layers of love circle charm necklace makes a meaningful family name necklace for a mom of three. 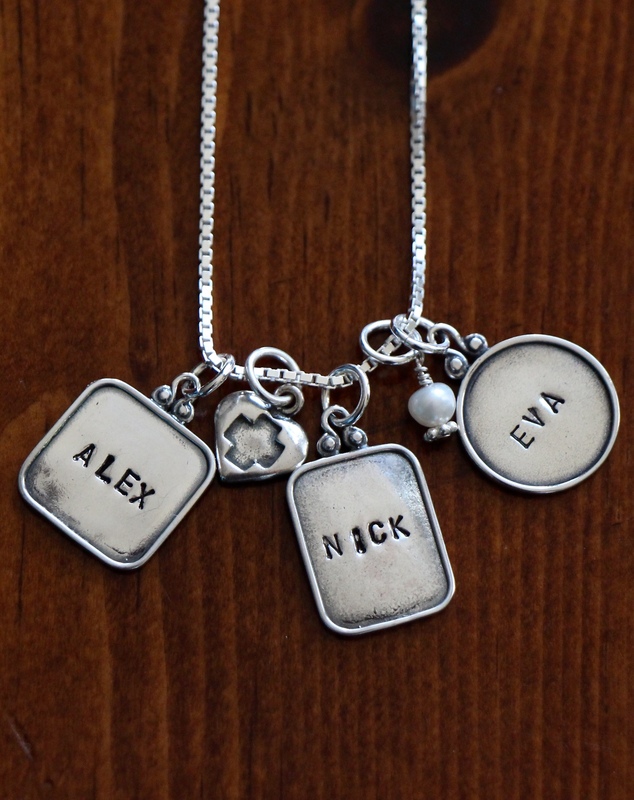 Sterling silver necklace features three circle name charms hand stamped with the names and birth dates of her children. 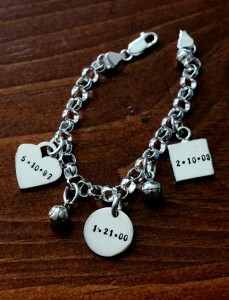 The bottom charm measures 1″ and allows nine letters. The middle charm measures 3/4″ and allows seven letters. 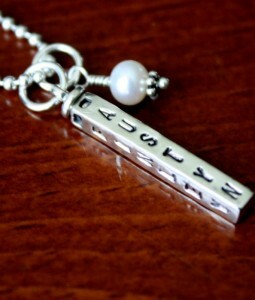 The top charm measures 1/2″ and allows up to five letters. Mother’s charm bracelet includes three thick charms, a combination of a heart, circle and square, hand stamped with the names or birth dates of her children. This sterling silver thick rolo bracelet is available in 7″, 8″ or 9″ and includes three signature name charms- a combination of a heart, circle and square. Optional Accent Charms may be added to represent the special people, accomplishments and events in your life. While Suzanne is preparing to be stuck at home for the next few days thanks to Winter Storm Jonas, we figured why not have a sale to celebrate. Shop early for your Valentine’s Day gifts and save 15% off your purchase of hand stamped name rings, personalized necklaces and charm bracelets. ends Sunday at 12pm est. – free shipping on all orders over $100. This sterling silver guitar pick is a perfect gift for your music lover this Valentine’s Day. A custom phrase up to 24 characters (including spaces) is hand stamped around the frame with a special date, monogram initials are stamped in the center. 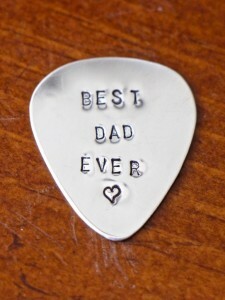 The guitar pick can be a keepsake gift to keep close in a pocket or turned into a keychain. SHOP K&S Impression’s Keychains & Guitar Picks Collection Today.